Volkswagen LT PDF Workshop, Service and Repair manuals, Wiring Diagrams, Parts Catalogue, Fault codes free download!! 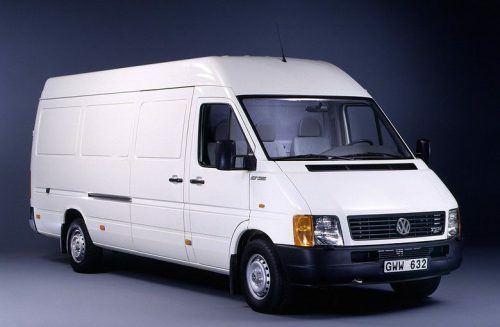 Volkswagen LT – a series of German small- and medium-tonnage trucks and minibuses produced by Volkswagen from 1975 to 2006. Multi-purpose LT cars of the first generation Volkswagen plant in Hanover began production in 1975. The name was an abbreviation for Lasten-Transporter, which in translation roughly means transportation for the carriage of goods. And in December 1995 the last LT of the first generation was released. A total of 471221 cars were produced. The extensive LT family of the first generation includes all-metal vans with low or high roof, minibuses, cargo-and-passenger machines (Combi), on-board trucks with single or double cab and chassis. Their total mass varies from 2.8 to 5.6 tons (as indicated by the digital index of models – LT 28, LT 45, etc.). The wheelbase can be of three sizes: 2500, 2950 or 3650 mm. The layout of the machine is with the cab above the engine and the rear drive axle. Specifically, for hard-to-reach regions, construction companies and campers, all-wheel drive versions (4×4) were built. Initially, they were equipped with a carburetor 4-cylinder engine (2.0 liters 75 hp). The following year, he added a 4-cylinder diesel engine firm Perkins (2.7 liters 65 hp). And in 1979 Volkswagen moved to 6-cylinder power packs of its own design, using the 4-cylinder Volkswagen Golf as the basis. In 1983, LT machines were upgraded. In the LT series, the heaviest LT 55 version and the upgraded 6-cylinder engine appeared. Changes have touched and the car interior (the new instrument panel and an electric windscreen was installed). In 1986, the family underwent another modernization, which affected the appearance (the replacement of headlamps round headlights for square) and the safety of the car (safety belts and additional body reinforcement are installed). In 1993, the last LT upgrade of the first generation was made (three new engines, a new radiator grille, new front and rear bumpers and an improved dashboard with decorative interior elements were added in the model line). The power steering and headlight corrector was installed in the base configuration. As an additional equipment, it became possible to install ABS. In 1996, Volkswagen and Mercedes-Benz jointly developed a new family of light trucks and buses: VW LT and Mercedes-Benz Sprinter. In order to reduce costs, both “whales” of the German auto industry tried to maximally unify their cars – mainly in the bodies and undercarriage. However, the engines, transmission and front design of each manufacturer had their own. After 1999, the difference became more significant. For example, the Mercedes-Benz Sprinter installed a new dashboard with a stylish “joystick” shift. VW also decided to leave the old simple interior – perhaps not with such a convenient, but more reliable, outdoor gear lever. LT models of the second generation differ from each other in full mass and base: LT28 – up to 2800 kg and 3000 – 3550 mm, LT35 – 3500 kg and 3000 – 4025 mm, and LT46, respectively, 4600 kg and 3550 – 4025 mm. Naturally, there are vans with low and high roofs and various types of partitions (or none at all) in the production program, cargo-passenger versions, buses, trucks and dump trucks with a conventional or dual cab and a chassis. The driver’s seat almost completely corresponds to the Mercedes-Benz Sprinter, which was produced before 1999. Good and numerous pockets and “glove boxes”, through which you can lay out cards, documents, first-aid kits and all sorts of small things. The disadvantages of the body a bit. Criticize the short-lived locks of door locks, which require relatively frequent replacement, and a weak blowing of the side windows, which is why in cold weather almost nothing is visible in the exterior mirrors. And this despite the fact that they are often equipped with electric heating. Another drawback – a weak footboard from the driver’s side, which can be corrected with wooden inserts for flimsy plastic.